Some strange pottery found at an ancient settlement in southeastern Utah contains the oldest known traces of chocolate in the United States, an anthropologist says. The site dates back to the 8th century — 200 years earlier than the only other known evidence of the food, found at Chaco Canyon, the famous ceremonial and trade center of the Ancestral Puebloans. 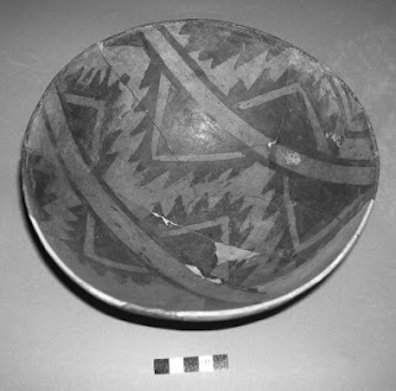 The residents of the Utah settlement, known as Alkali Ridge, were also Pueblo ancestors, but the chocolate found in so many of their jars, pitchers, and bowls — as well as the pottery itself — suggests that they might not have been alone. This 1,200-year-old bowl contained traces of cacao, a new study says. Dr. Dorothy Washburn, a researcher at the University of Pennsylvania’s Museum of Archaeology and Anthropology, studied the residues in 18 vessels first unearthed at one of the settlement’s sites in the 1930s. She and her team — including her husband, a chemist for Bristol-Meyers Squibb — found that 13 of the artifacts contained traces of cacao, also known as cocoa. The tell was a chemical called theobromine, a compound like caffeine that cacao has in abundance. The only other plant in North America that produces theobromine is Ilex vomitoria, a toxic holly that some Midwestern cultures used to induce ritual vomiting. But the holly, Washburn said, is only found in the Southeastern United States, whereas cacao was a known staple of life and trade in Mesoamerica. “The only conclusion can be that it’s cacao,” she said. Since the cacao tree, Theobroma cacao, is a tropical plant not found within thousands of miles of Utah or Chaco, how it arrived in the American Southwest is something of a mystery — and a controversy. The conventional view is that cacao, prized as a natural stimulant, came via trade routes that the ancestral Pueblo shared with Mesoamerican cultures, which valued chocolate as an important food and ceremonial drink. Seeds in the fruit of the cacao tree were fermented and ground to make a stimulating drink. “We’re arguing that people were moving from Mesoamerican areas up north into the Southwest. It was not just traders and isolated instances of trade,” she said. The chocolate is only the latest evidence of a gradual but deeply influential migration from what’s now Mexico and Central America into the Southwestern United States, she said. What’s even more persuasive than the far-flung cacao is the pottery it was found in, she added. While local ceramics around Alkali Ridge were thick-walled and heavy, with black designs painted on white, the vessels found at one abandoned pit house, called Site 13, included many delicate orange wares of unusual shapes, painted with red patterns. Since earlier tests of the clay had revealed them to have been made from local materials, these outliers weren’t imported, Washburn said. Instead, they must’ve been made by someone from another culture, with different potting and painting traditions. The migration theory fits with the historical environment of the time, she added, because Mesoamerica — much like Alkali Ridge — was undergoing a great upheaval in the 8th century. Teotihuacan, the giant metropolis in central Mexico, had collapsed less than a century before Site 13 was settled, sending waves of emigrants in all directions. “And by 900, many of the Mayan city states had also collapsed,” she added. “The results for North America was that people were moving all over. Washburn acknowledged that her conclusions are controversial. Critics question how chocolate could appear to be so prevalent at Alkali Ridge, while there are no oral, epigraphic or any other references to its use — let alone any physical evidence of cacao plants themselves, like seed pods. Perhaps more important, many archaeologists hew to the opinion that the great developments of ancient America — like the sophisticated complex at Chaco Canyon — were largely the handiwork of indigenous, uniquely North American cultures. The prospect that the ancestral Pueblo were heavily, and directly, shaped by Mesoamerican migrants has meant that “there are a lot of archaeologists that aren’t happy,” Washburn said. The research appears in the Journal of Archaeological Science. I knew my love for Chocolate felt a bit primitive and overwhelming! Wonder what things would have been like if the native cultures around the 1800’s had survived what amounts to a holocaust. Bet you we wouldn’t be worried about Syria today. Wait – I’m confused. So the theobromine on these pots is found naturally in both holly leaves and cacao, but Dr. Washburn says it could only possibly have come from cacao in Central America? And the reason she is so certain of this is because the Holly, which only grew in Southeastern America but was actually found to be used by cultures in the Midwest couldn’t have also made it’s way to modern day Utah? I just don’t get it – The Pueblans definitely had trade routes with the Midwest – why is she so certain? Because people believe what they want to believe. Because the holly was only used in rituals where they wanted to induce vomiting, whereas cocoa was a staple. She is stating that it is more likely that cultures traded staples, rather than very specialized ritual materials. Sorry but pre-Columbian cocoa was not a stable; rather it was treated as high-status trade item even within Mesoamerica. Although the post-Classic Toltec of central Mexico produced a fine Orange Ware, there was a ceramic Ware-type actually made at Alkali Ridge known as Abajo Red-on-orange. Abajo Red-on-orange is somewhat of a unique Anasazi type as it appears to be a local copy of early southern Mogollon red-on-browns. This may prove interesting as the southern Mogollon region of southwest New Mexico and southeast Arizona historically served as the point of entry between the American southwest and Mesoamerica. As I’m fond of telling people, Ilex vomitoria does not cause vomiting. The ritual involves drinking the tea and then inducing vomiting. Interesting. The review of this article also does not mention that vessels in Chaco Canyon have been found with chocolate residue. Also, chemical studies can be done on the “imported” pottery to source the clay and temper. I do not see that mentioned in this review. Hi again. Just to clarify, the reporting is pretty lucid in stating that the ceramics are not imported, as that was one of the key points of the JAS study: “earlier tests of the clay had revealed them to have been made from local materials.” Thanks again for contributing, though. I’m not saying it’s aliens, but….. It’s aliens. If you’re looking for more, just drop us a line. Thanks again. What do you think of something like the Southeastern Cultural Complex, or even the Hopewell Tradition, each of which had vast trade networks for items specific to class and ritual burial? Things like shell from the Gulf, grizzly teeth from the Rockies, flints, mica, and obsidian were imported so the higher-classes could reinforce their status and be ritually buried with exotic grave goods? I know it’s probably unlikely that high-status people in Utah were drinking this vomit drink to somehow reinforce their rank, but I think it’s totally plausible that it could have been imported for ritual purposes. To say that cacao is the only conclusion seems kind of closed-minded. How can they know that the cacao was not contamination, from modern researchers handling the pieces? If they have used standard excavation, handling, and bagging procedures, this should not happen. Chemical trace analysis is a standard physical anthropology technique by now, and I doubt such a team would be ignorant of its requirements visa vi contamination. I worked at the University of Colorado Archeological Field School at Mesa Verde during my undergraduate days and also did some very prelimnary work with botanical remains from archeological sites in the area. 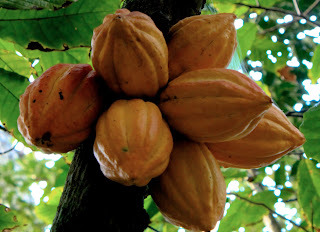 I don’t recall any reports of any cacoa plant remains being identified in published studies. If cacao was so widely consumed in the Southwest shouldn’t such remains have been found?